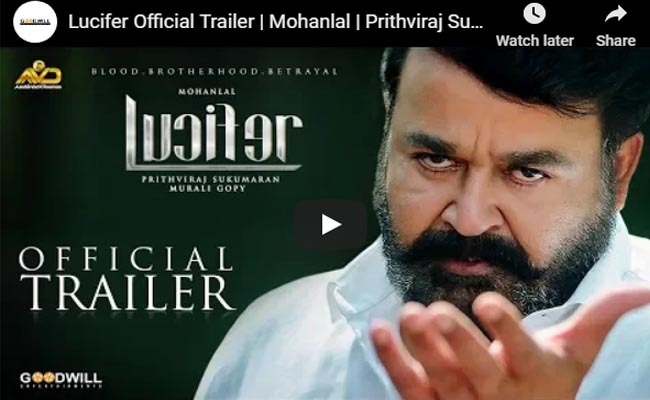 The trailer of Prithviraj directorial Lucifer happens to be one of the most awaited video footages in social media spaces. Living up to the hype, which it had created, the trailer has gone onto reap couple of records in the virtual space. Released last night, the trailer has been viewed by 3.3 million viewers within 24 hours of its release. Now, this is a new record in Mollywood and is certainly, one of the most appreciated works as well. Movie buffs in the state have gone onto praise the technical sides, with many commenting on the frames chosen by director. Interestingly enough, there were some goosebump moments for the fans of Mohanlal inside the trailer, which runs into 3 minutes. Though it hasn’t given out much about the story, the trailer however has ensured that the movie would have ample space to showcase the acting prowess of the stars in it. Touted to be a political drama, Lucifer is reportedly going to hit close to 1,500 screens worldwide.